SciGene Products - CytoBrite® Duo Slide Incubation System. 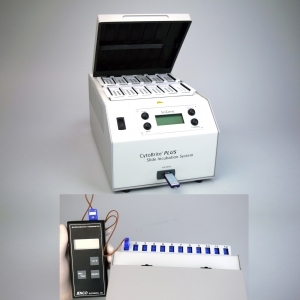 Home > Products > CytoBrite® Duo Slide Incubation System. Dual temperature slide heating instrument for performing denaturation and incubation of FISH slides. Consists of two independently controlled heat blocks that each hold a removable 6-slide tray. Trays streamline slide set up and are used to transfer slides between the heat blocks. A built-in temperature calibration system eliminates the cost of third party calibration required for CLIA compliance. Typically, a tray is moved from a 37°C block to a second block set to the required probe denaturation temperature for a prescribed time. The tray is then returned to the 37°C block or transferred to a CytoBrite Slide Oven for overnight incubation. When combined with the oven, up to 72 slides can be incubated simultaneously; equivalent to SIX ThermoBrites at a fraction of the cost and bench space. Used with CytoBond Removable Coverslip Sealant that doesn’t dry out and removes cleanly and in one-piece post-hybridization. CytoBrite Duo Slide Incubation System, 115/230V. Includes 2x 6-slide trays.